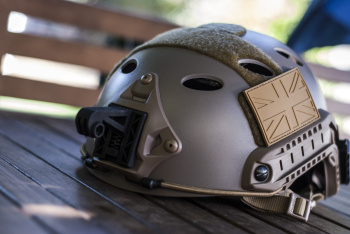 Looking at helmets and was looking at OneTigris but told the FMA ones are adjustable so worth spending a few quid more on one of them. 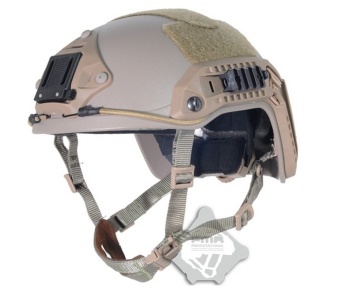 Ive found them on http://www.fire-support.co.uk/product/fma-ballistic-helmet-dark-earth-lxl but there seems to be far more of a selection on ebay. Are these the genuine article or just chinese knockoffs? They are ALL chinese knock offs. unless they are kevlar, weigh 3 tonnes and cost ££££ they are all chinese. Oh everything is made in China, guess what Im asking is the quality of the ebay chinese ones going to be the same as those imported and sold here thus having to abide by our quality controls. They're the same product. Just with a markup for being sold in the UK. 2 weeks to turn up, and its too small. Gah. Buy one which has an adjustable wheel on the back of the helmet that way if it's too big you can make it smaller. I have a Nuprol one in Atacs-FG with the adjuster wheel on the back it's excellent, don't even need to use the chip strap to keep it from falling off even when i've had NVG on it as well. Turned up today, this is the maritime version this time and much better size. Gone back to the FAST ABS PJ Helment, didnt like the high cut of the maritime helmet. If I had headphones it would be perfect but as I dont its just a big patch of head waiting to get hit.